In this March 3, 1932, file photo, the USS Sequoia is viewed in Washington, D.C. An investment group with ties to a wealthy industrialist family in India can take ownership of the former U.S. presidential yacht Sequoia with no payment to its current owner, a Delaware judge ruled Monday, Nov. 14, 2016. Photo via AP Images. 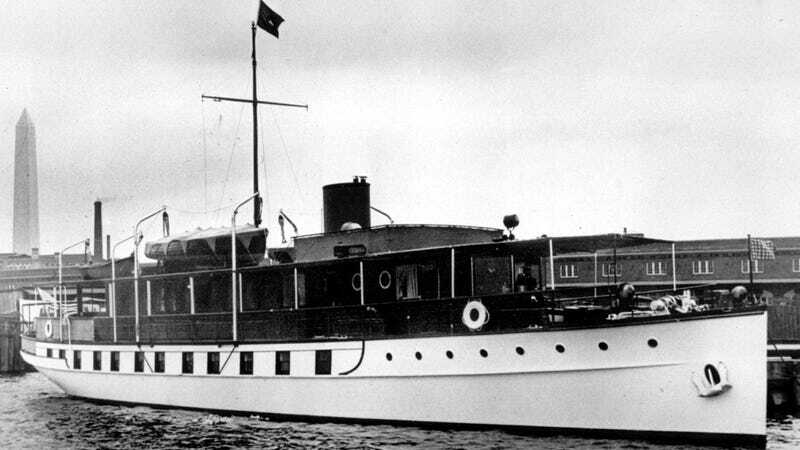 Did you know that, once upon a time, there was an official U.S. Presidential yacht? The USS Sequoia is now a National Historic Landmark, and a judge says it’s deteriorating and inhabited by raccoons. Wow—another neat metaphor. The Commerce Department bought it from private owners in 1931, primarily using it as a booze-busting ship during Prohibition. Herbert Hoover liked to requisition it from time to time — to tool down to Palm Beach with the missus — and it was soon the president’s official yacht. Jimmy Carter sold it for $286,000 in the malaise days of the 1970s and it bounced around various owners, before finally landing with in 2000 with businessman Gary Silversmith, who did restoration work and rented it out for cruises. More recently, however, the Guardian reports (h/t Fark) it became the subject of litigation between Silversmith and an investment group named FE Partners, from which the legal entity which technically owns the yacht borrowed a bunch of money—boats, especially antique wooden boats, being at best an expensive nightmare to maintain. Monday’s ruling stems from a lawsuit filed in 2013 by Sequoia Presidential Yacht Group LLC, led by Washington lawyer and businessman Gary Silversmith. A year earlier, the Sequoia group entered into a $7.5 million loan agreement with FE Partners to help pay off certain obligations and provide operating and capital funds. The agreement gave FE Partners the right to exercise an option to purchase the yacht for $7.8 million in the event of a default. Sequoia sued to prevent FE Partners from exercising its purchase option, but after the judge found that the loan was fraudulently induced, Sequoia agreed to a default judgment in favor of FE. That set off a new round of litigation as attorneys argued over how much the option price should be reduced because of needed repairs, liens and other outstanding liabilities. Well, Delaware judge Sam Glasscock has ruled that, bottom line, the numbers work out to a $0 bill for FE Partners to take the yacht. “The Sequoia, an elderly and vulnerable wooden yacht, is sitting on an inadequate cradle on an undersized marine railway in a moribund boatyard on the western shore of the Chesapeake, deteriorating and, lately, home to raccoons,” he said in his decision. A deteriorating yacht inhabited by raccoons. Hmm, haven’t used that one yet.